Police are not welcome in this space at any time. Journalists should identify themselves and be prepared to leave if it is not appropriate for them to observe discussions. 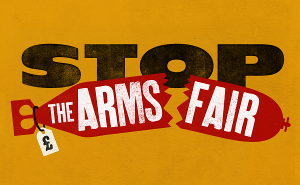 We welcome everyone who enters this space with the aim of stopping the arms fair as an equal participant in our movement. We believe each of us has something to contribute and something to learn. We are a collective based on trust, respect, and taking responsibility for our actions. We consider any behaviour which demeans, marginalises, threatens or harms anybody as oppression, and we commit to challenging it. We do not tolerate violence, intimidation, harassment or unwanted sexual contact. Anyone responsible for such actions will be excluded. We will challenge any oppressive behaviour or language, regardless of intention (e.g. telling an oppressive joke, using unspoken privilege to interrupt someone). Providing a safe and welcoming space is everybody’s responsibility, it is not only the duty of those subject to oppression to challenge that oppression. We ask all participants to challenge attitudes and behaviours in a way that is responsible and constructive. Be aware of the range of different identities (genders/races/classes/sexualities/abilities) that people may identify with, and avoid making generalisations or assumptions about people. Please be aware that this is also a trans friendly space. Do not assume use of pronouns. Ask people what names they want to be known by. Identify your own privileges (e.g. class, gender) and actively challenge and work against them (e.g. if you identify as a man and notice that men are dominating a conversation, actively make space for people of other genders to make themselves heard). If you have any questions or concerns, please contact the organisers.